The RAM 3500 pickup trucks are some of the most powerful pickup trucks on the road today. Delivering more power and features than the RAM 1500 or RAM 2500 models, the RAM 3500 is truly a showcase of power, agility, and performance. The RAM 3500 navigates any type of terrain, and can perform exceptionally well in any weather conditions. The RAM 3500 is not your average work truck, featuring a modern and well-appointed interior, that feels more like a luxury SUV. The RAM 1500, 2500, and 3500 all have different overall capabilities, with the 3500 offering more power than the other two models. The 2015 RAM 3500 offers drivers unique added exterior features such as the RAMBox Cargo Management system, that delivers peace of mind, and convenience. With the changing technological times, a work truck isn’t what it used to be. Carrying heavy loads, towing large trailers, and having the ability to travel on and off-road, aren’t the only aspects of a work truck that need to be considered. Technology, comfort, and class play a large role in the average work truck of today, and the 2015 Ram 3500 accommodates each one of those categories. Featuring more interior convenience and technological features than ever before, the 2015 Ram 3500 truly has it all. Check out each of the incredible features that come as either standard or optional equipment. The 2015 Ram 3500 is bursting into the future with incredible standard and available technology that will help the modern-day working man get the job done. Staying connecting will never be an issue, regardless of location. 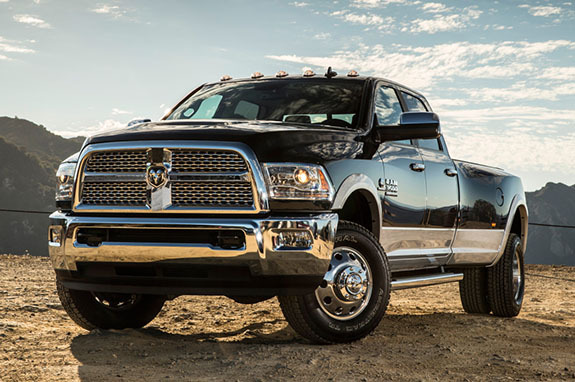 The 2015 Ram 3500 is truly an office on wheels. 8.4-inch Uconnect Touchscreen is the largest in its class. The customizable multi-functioning interface will give the driver complete command of the truck. WiFi Hotspot is built into the Ram 3500, ensuring a strong connection for answering e-mails, bidding jobs, and keeping in touch. Navigation will make sure you never get lost, no matter how far you stray from the paved highway. Every square inch of the Ram 3500’s interior is utilized for full convenience of the driver and passengers. Keep your cabin floor clear of clutter with the built-in under-seat storage available in Crew and Mega cab truck models. This standard feature is a convenient way to keep your mobile office looking neat and tidy. 7-inch multiview display in the RAM 3500’s dash has a bright full-color LCD display. Optional premium leather seating with stylish stitching gives the cabin on the Ram 3500 a premium look, with practical comfort. With the turn of a knob, switch from rear-wheel drive to four-wheel drive. The ability to make the change as quickly as the terrain or weather shifts. Each one of RAM’s trucks has unique capabilities and features. Each level offers drivers different towing, payload, horsepower, torque, and much more. The 2015 Ram 3500 offers the best in power, performance, and towing. Check out how each one measures up below. Efficiency - With a highway fuel economy of 25 miles per gallon, the Ram 1500 offers one of the best fuel economies in its class. Power - Towing capacity of 7,600 pounds, and a maximum payload of 1,900 pounds. Performance - Featuring 383 horsepower, 400 lb.-ft. of torque, and a 10,000-mile oil change interval. Power - Towing capacity of 13,870 pounds, and a maximum payload capacity of 3,040 pounds. The Ram 2500 and 3500 both have the same engine and performance specs, but the 2015 Ram 3500 delivers on the most power, offering the highest maximum towing and payload capacities. The 2015 Ram 3500 is the powerhorse pickup out of the three Ram pickup trucks. The newest exterior feature to the RAM 3500 line of pickup trucks, is also one of the most practical features ever to be seen on a full-size pickup truck. The RAMBox is the perfect solution for the driver who needs to lock up tools during the day, but also comes in handy for the everyday joe who needs a little extra safe storage space. The pickup truck has always provided drivers with a unique set of features that SUVs and sedans can’t offer. Despite this, the pickup truck has always been missing a feature that nearly every other vehicle has to some extent: a trunk. Even though the RAMBox is not a traditional trunk, it does provide out-of-sight storage that can be securely locked. Regardless of who uses it and for what reason, the RAMBox cargo management system is as unique as it is practical. This class-exclusive feature is a lit, secure, and durable storage system that is embedded in the side rails of the Ram 3500’s truck bed. The drainable storage units have an available AllSecure remote security system, that allows for drivers to lock and unlock the cargo box with the click of a button. 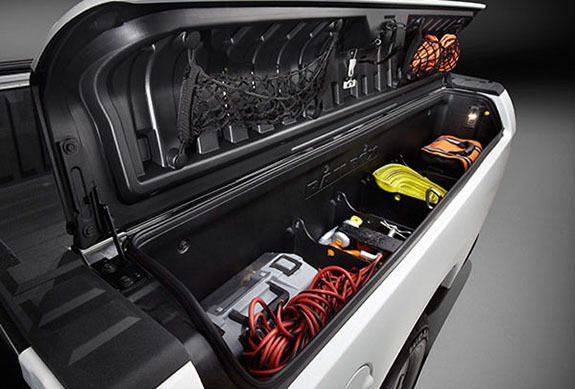 Whether it is expensive tools, sporting equipment, or luggage, the RAMBox cargo system is the perfect solution for storage on the go for the 2015 RAM 3500.